Caterpillar is bringing back 9,000 laid-off workers worldwide. McDonald's is planning big "Hiring Day" for 700 part-time crew and managers in Utah. Thanks to Kevin Wroblewski for the McDonald's story. What If I Had Bought Apple Stock Instead? On November 10, 1997, Apple released the Apple PowerBook G3 250 computer for $5,700, when Apple stock was trading at $4.67 per share. 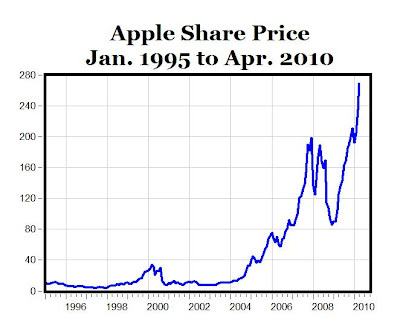 Apple is now trading at $262.93, or about 56 times the share price in 1997 (see chart above). 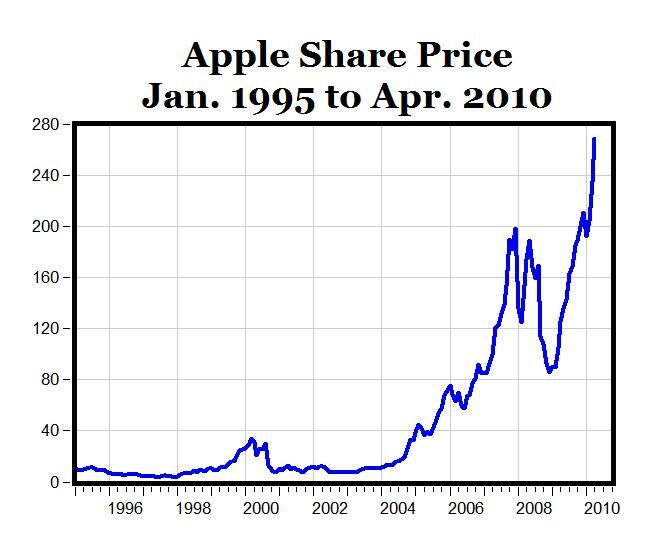 What if instead of buying the Apple computer in 1997 for $5,700, you had purchased 1,221 shares of Apple stock with your money? Today, those shares would be worth about $321,000 (APPL is trading at $262.93 right now). See more of these comparisons for different Apple computers in different years here. 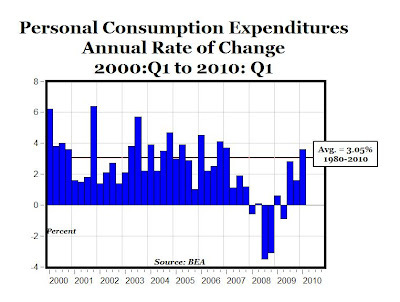 One highlight of today's BEA report on GDP is that real personal consumption expenditures increased 3.6% in the first quarter, which is the largest quarterly growth in consumer spending since the 3.7% growth in the first quarter of 2007 (see chart above). It's also the first time since 2007 of three consecutive quarters of positive growth in consumer spending, and is above the 3.05% average growth rate since 1980. 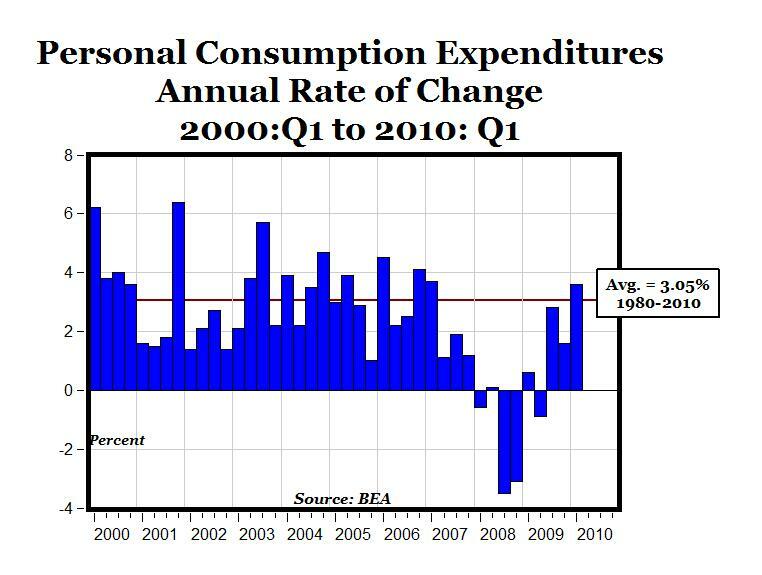 This rebound in consumer spending starting in the third quarter of 2009 provides further evidence that the recession ended last July, and we are now ten months into an economic expansion that is gaining strength and momentum with almost every new economic report. "The Association of American Railroads (AAR) said today that rail freight traffic is continuing to gain strength as weekly carload volume was at its highest level since the first week of December 2008, and weekly intermodal volume reached its highest level this year. U.S. railroads originated 298,218 carloads during the week ended April 24, 2010, up 14.6 percent from the comparable week in 2009. However, volume was still down 10.8 percent from 2008. In order to offer a complete picture of the progress in rail traffic, AAR now reports 2010 weekly rail traffic with comparison weeks in both 2009 and 2008. Intermodal traffic totaled 212,347 trailers and containers, up 15.1 percent from last year but down 5.4 percent compared with 2008. Compared with the same week in 2009, container volume increased 17.3 percent while trailer volume gained 4.2 percent. Compared with the same week in 2008, container volume was up 2.7 percent while trailer volume fell 34.5 percent. All 19 carload commodity groups were up from last year, led by gains in commodities associated with the steel industry: metallic ores, up 163 percent; metals, up 80.2 percent; waste and scrap, up 59.7 percent; and coke, up 12 percent. Other notable increases included 25.3 percent for motor vehicles and equipment; 45.2 percent for primary forest products; 22.8 percent for lumber and wood products; and 13.1 percent for chemicals. Grain was up 20.1 percent, and coal rose 6 percent. Combined North American rail volume for the first 16 weeks of 2010 on 13 reporting U.S., Canadian and Mexican railroads totaled 5,846,219 carloads, up 7.6 percent from last year, and 4,062,641 trailers and containers, up 9.9 percent from last year." Craig's List: Tickets for $40. We're all familiar with movie reviews, restaurant reviews, etc., but I didn't know there were "blog reviews," until I saw this recent blog review of Carpe Diem. From the Qliance website: "Traditionally, over 40¢ of every $1 you spend on health care goes toward insurance billing and overhead (see chart above). This means your clinician must work harder and faster, seeing more patients each day just to make ends meet. As a patient, you experience longer wait times, shorter appointments and higher costs. Qliance is like a health club membership, but for health care. 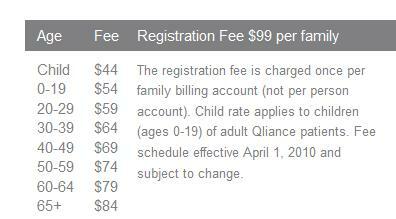 Your membership gives you unrestricted access to your Qliance clinician and services for one monthly fee. Instead of dealing with costly overhead, we reinvest that 40¢ in our clinics, electronic medical records and in patient services. You experience shorter wait times, longer appointments and lower costs." From the WSJ: "Qliance operates three clinics in the Seattle area that offer primary care treatment to patients who pay a monthly membership fee ranging between $44 and $84, depending on their age. The company accepts no form of health insurance for its services. Qliance intends to use its financing to expand in Washington State, with plans to open clinics beyond the state as early as next year. The company argues that its care covers roughly 90% of the medical issues that people see doctors for, from checkups to minor fractures to vaccinations, as well as ongoing care for chronic illnesses like hypertension. Qliance members typically pay other companies for insurance to cover emergency procedures and serious illnesses, such as cancer. Qliance is betting it can profit by wringing many of the administrative costs out of health, especially the overhead that comes with haggling with insurance companies and billing patients. The company’s clinics are open seven days a week and says its doctors are able to spend more time with patients – at least a half-hour for routine appointments and an hour for physicals – than most physicians who take insurance do." MP: This is another great example of an innovative, market-based approach to health care (similar to the 1,171 retail health clinics currently operating in 40 states, but with expanded services) that continue to develop, despite the government takeover of the health care system. By eliminating insurance and billing overhead, Qliance gets the monthly cost of health care down to about the same cost of a monthly cell phone plan. Unfortunately, Obamacare will send costs in exactly the opposite direction - higher and higher with an increase in bureaucracy, overhead and paperwork. 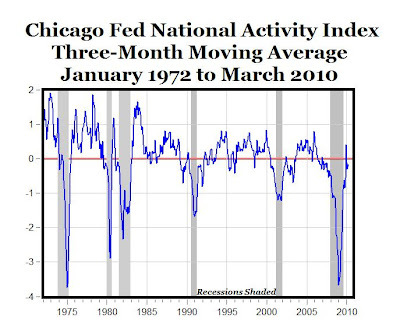 CHICAGO FED -- Led by improvements in production- and employment-related indicators, the Chicago Fed National Activity Index increased to –0.07 in March, up from –0.44 in February. Three of the four broad categories of indicators that make up the index made positive contributions in March, while the consumption and housing category made the lone negative contribution. 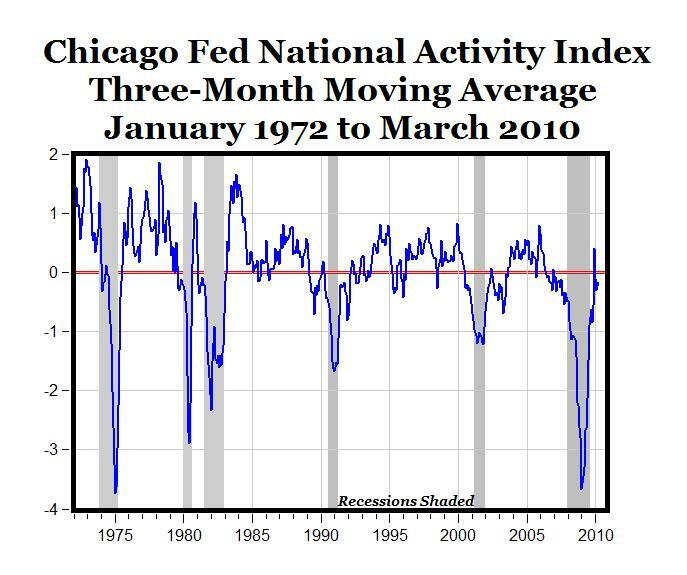 The index’s three-month moving average, CFNAI-MA3, increased to –0.18 in March from –0.31 in February (see chart above). March’s CFNAI-MA3 suggests that growth in national economic activity, while still below average, continues to improve. With regard to inflation, the amount of economic slack reflected in the CFNAI-MA3 indicates subdued inflationary pressure from economic activity over the coming year. 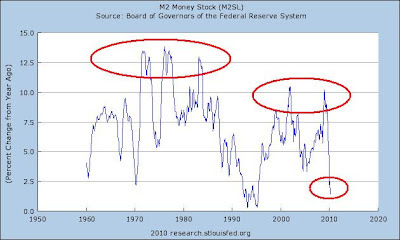 Explanation: When the CFNAI-MA3 value moves below –0.70 following a period of economic expansion, there is an increasing likelihood that a recession has begun. Conversely, when the CFNAI-MA3 value moves above –0.70 following a period of economic contraction, there is an increasing likelihood that a recession has ended. MP: The CFNAI-MA3 has now been above -0.70 for the last five months, and in six out of the last seven months, signalling the end of the recession. Further, the strong improvement in the CFNAI-MA3 in the last year follows the same pattern following the end of the last five recessions, especially the recessions of the 1970s and 1980s. April 28 (Bloomberg) -- Dow Chemical Co., the largest U.S. chemical maker, reported first-quarter profit that surged more than analysts estimated, boosted by higher sales of commodity plastics and rebounding demand in the U.S. and Europe. About 64 percent of Dow’s sales were outside North America last year. Profit surged to $718 million from $122 million in the basic-plastics segment, the world’s largest producer of polyethylene used in bags and packaging. Dow’s plastics benefited as costs for natural gas, a key raw material in the U.S., were lower relative to oil, the ingredient used in Europe and Asia, said P.J. Juvekar, a New York-based analyst at Citigroup Global Markets. MP: The chart above shows that Dow Chemical has increased 140% in the last year compared to the DJIA, which has increased 40%. These figures have been out for awhile, so this is a little outdated, but I'm using the chart for a talk tomorrow and thought I'd post it, with an explanation of the lag. 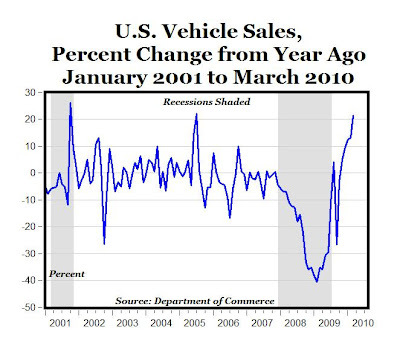 Vehicle sales increased in March by 21.3% compared to the same month last year, the highest annual increase since July 2005 (data here). The International Air Transport Association (IATA) announced today that March 2010 international scheduled air traffic showed continued strengthening of demand. Compared to March 2009, passenger demand was up 10.3%, while cargo demand grew 28.1%. 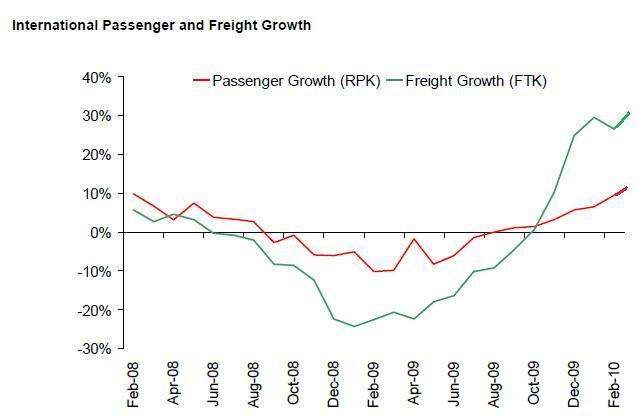 Both are improvements from the 9.0% and 26.3% growth for passenger and freight demand recorded in February. These are strong gains, but the data is being compared to March 2009, which was the low point for international air travel during the recession. “March results show that the pace of the upturn is strong. But the trauma of the recession is not over. The industry has lost two years of growth, and passenger and freight markets are still 1% below early 2008 highs. Nonetheless, the pace of improvement, based on an improving global economic situation, is much faster than anybody would have expected even six months ago,” said Giovanni Bisignani, IATA’s Director General and CEO. 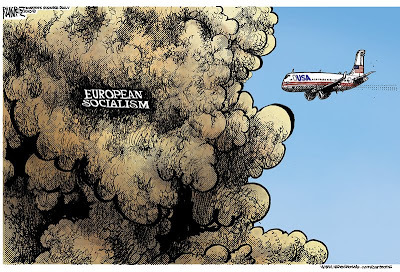 IATA noted that the International Monetary Fund revised global GDP growth forecasts from 3.0% to 4.3% for 2010. The strong traffic recovery is expected to show a dip in April as a result of the eruption of an Icelandic volcano in April that saw the shutdown of large portions of European airspace over a six-day period. Florida’s existing home sales rose in March, which means that sales activity has increased in the year-to-year comparison for 19 months, according to the latest housing data released by Florida Realtors. 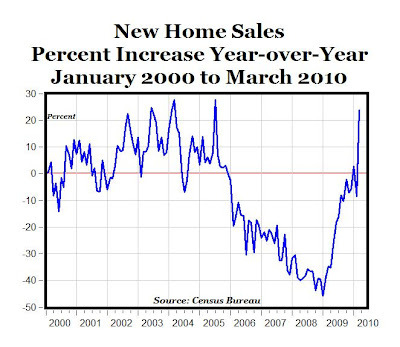 Existing home sales increased 24 percent last month with a total of 16,294 homes sold statewide compared to 13,090 homes sold in March 2009 (see chart above). Statewide existing home sales last month increased 37 percent over statewide sales activity in February (11,890 homes sold). Also noteworthy: While March’s statewide existing-home median price of $137,000 was down from the same time a year ago, it was 4.3 percent higher than February’s statewide existing-home median price of $131,350. MP: These recent sales data for Florida paint a much more positive picture of the Florida real estate market than the Case-Shiller home price data released yesterday, which showed annual price declines through February 2010 of -7.7% for Miami and -9.8% for Tampa. For March 2010, the statewide median price decline was only -3% versus March 2009, and the other key variable - home sales - was up by 24% since last March. 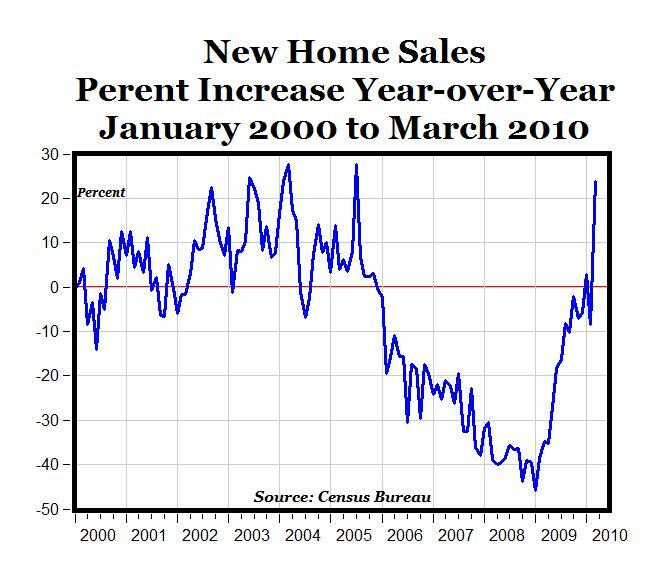 Assuming the median home price is not too different than the mean home price, the total housing sales volume increased from about $1.85 billion in March 2009 to about $2.23 billion in March 2010, for a 20.5% increase. If we measured housing market activity like we measured vehicle sales - in unit sales, without regard to price - we would conclude that the Florida housing market is booming, with 19 consecutive monthly increases compared to the same month in the previous year, and a whopping 24% increase from March of last year. 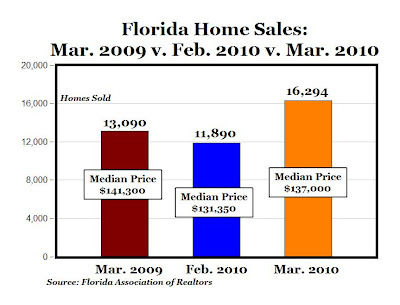 And if we measured housing activity like we measure retail sales (total sales volume), we would also conclude that the Florida housing market is doing quite well, with something like a 20% increase in sales volume (assuming the median home price is an accurate estimate of the mean home price). 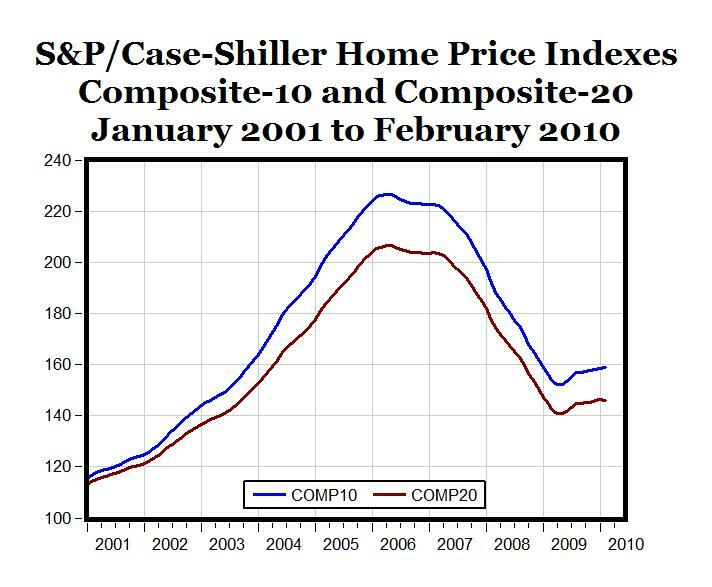 Isn't that a possible limitation of the Case-Shiller Home Price Index as a measure of the real estate market - it only looks at one of the key housing indicators, price, and completely ignores the other key variable, units sold; and therefore also fails to measure housing sales volume? "In the end, we learn a lot from this latest SEC fiasco. The agency that cannot detect a Madoff fraud can conjure up a Goldman fraud out of thin air. At this point, some fundamental reform is in order. Forget the fancy stuff. Either the SEC should master its primary fraud prevention mission, or it should shut down altogether." BISMARCK, N.D. (AP) - North Dakota has surpassed Louisiana as the fourth-largest oil-producing state in the nation, the U.S. Energy Department says. North Dakota has risen from being the ninth-largest oil-producing state in 2006. BISMARK TRIBUNE - It has taken millions of dollars in investment by private industry to bring the necessary pipelines and rail facilities up to the volume necessary to handle the state's record crude oil production. It's an investment that the citizens of North Dakota should appreciate. It means jobs and state tax revenue. The state set a per-day record of 261,000 barrels in February. Before the infrastructure improvements, the state's pipeline, rail and refining capacity was only 189,000 barrels a day. Now, based on recent investments, that capacity is about 400,000 barrels a day. It should be enough to handle the expected growth in crude oil production for the next two years, if the price remains steady. And recent history suggests that production from the Bakken Formation will continue to grow beyond that limit. MP: North Dakota currently has the lowest unemployment in the country at just 4%, and no other state is even really close - the next lowest jobless rate is 4.8% for South Dakota, and Michigan is more than ten points higher at 14.1% for March. The oil and jobs boom in North Dakota is creating a new problem - a temporary shortage of housing for all of the workers, see NY Times article. It was a bunch of A students at the Defense Department who planned the syllabus for the Iraq war, and to hell with what happened to the Iraqi Class of ’03 after they’d graduated from Shock and Awe. The U.S. tax code was written by A students. Every April 15 we have to pay somebody who got an A in accounting to keep ourselves from being sent to jail. Smart people have their uses, but our country doesn’t belong to them. As the not-too-smart Woody Guthrie said, “This land was made for you and me.” The smart set stayed in fashionable Europe, where everything was nice and neat and people were clever about looking after their own interests and didn’t need to come to America. The Mayflower was full of C students. Their idea was that, given freedom, responsibility, rule of law and some elbow room, the average, the middling, and the mediocre could create the richest, most powerful country ever." 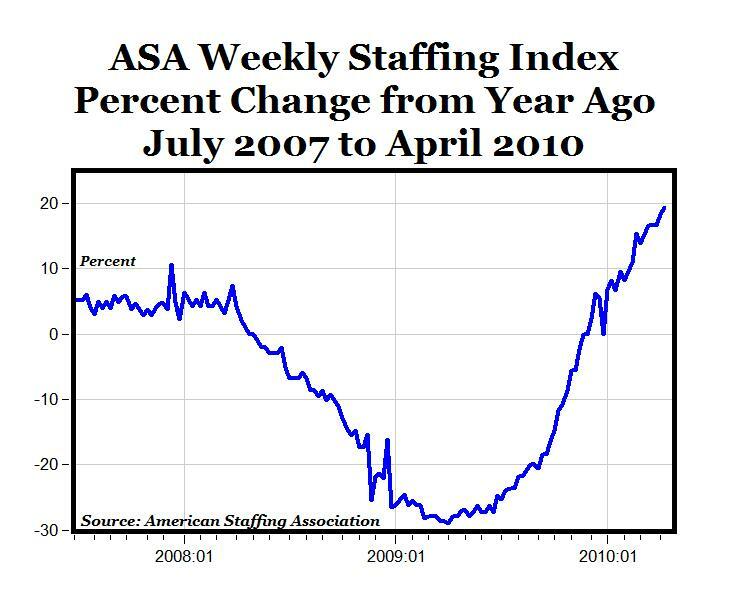 "Staffing employment in April is 19% higher than in the same month last year, according to the ASA Staffing Index released today. The index for April is 86, up from 83 for March, suggesting that staffing employment has increased almost 4% over the past month. With the exception of the payroll period that included the Easter holiday, staffing employment has shown steady growth over the past 10 weeks." 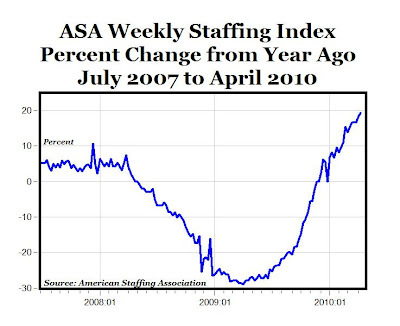 MP: The chart above is based on the ASA's weekly staffing index, which reached an 18-week high during the week of April 12, and has increased by 19.4% over the last year. This most recent weekly gain marks the ninth week in-a-row of double digit increases from the same week in the previous year. Temporary help employment tracked by ASA is considered to be an accurate leading indicator of employment trends. According to the ASA, temporary job increases typically lead gains in broader employment growth by three months when the economy is emerging from a recession, and the continuing strength in temporary hiring signals future employment growth for the U.S. economy. 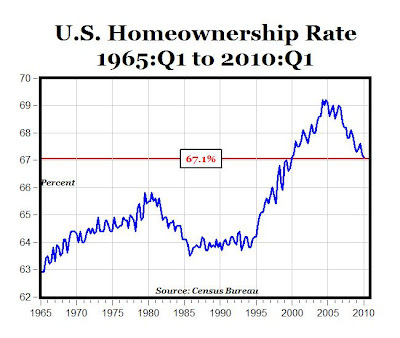 According to data released yesterday by the Census Bureau, the U.S. homeownership rate fell to 67.1% in the first quarter of 2010, the lowest rate since the first quarter of 2000, exactly ten years ago (see chart above). Compared to the peak of 69.2% in the second quarter of 2004, the homeownership rate has fallen by more than two full percentage points in the last six years. The housing bubble that burst in 2007 and led to a financial crisis can be traced back to federal government intervention in the U.S. housing market intended to help provide homeownership opportunities for more Americans. This intervention began with two government-backed corporations, Fannie Mae and Freddie Mac, which privatized their profits but socialized their risks, creating powerful incentives for them to act recklessly and exposing taxpayers to tremendous losses. Government intervention also created “affordable” but dangerous lending policies which encouraged lower down payments, looser underwriting standards and higher leverage. Finally, government intervention created a nexus of vested interests – politicians, lenders and lobbyists – who profited from the “affordable” housing market and acted to kill reforms. In the short run, this government intervention was successful in its stated goal – raising the national homeownership rate. 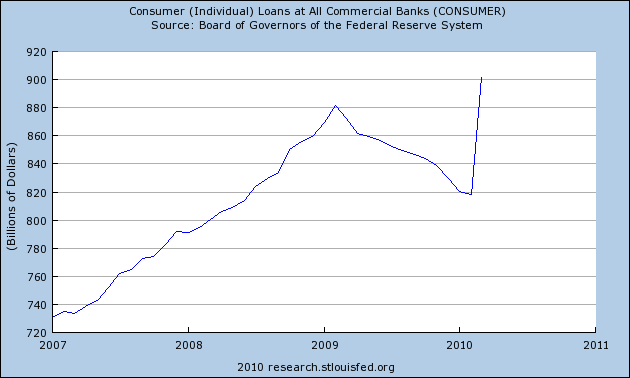 However, the ultimate effect was to create a mortgage tsunami that wrought devastation on the American people and economy. Bottom Line: Our political infatuation with homeownership turned thousands of good renters into bad homeowners and consequently turned the “American Dream” into an “American Nightmare” for many Americans. The fact that many homeowners are now returning to once again being good renters is a sign of progress, and the significant decrease in the U.S. homeownership rate to a ten-year low should be considered a very positive trend. 1. A total of 4,328 new and resale houses and condos closed escrow in the Las Vegas metro area last month, up 31.9 percent from February and up 12.7 percent from a year earlier. 2. March’s sales total was the highest for that month since March 2006, when 8,486 homes sold, and it was 0.8 percent lower than the average March sales tally back to 1994. Last month marked the 19th in a row in which total sales rose on a year-over-year basis. 3. The number of houses and condos that resold (excludes new homes) in March rose to 4,334, up 30.9 percent from February and up 12.3 percent from a year earlier to the highest point since 4,721 resales in March 2006. Resales have risen on a year-over-year basis for 23 straight months. 4. Foreclosure resales – homes that had been foreclosed on in the prior 12 months – fell to 55.5 percent of all resales in March, down from 59.6 percent in February and down from 73.1 percent a year ago. 5. 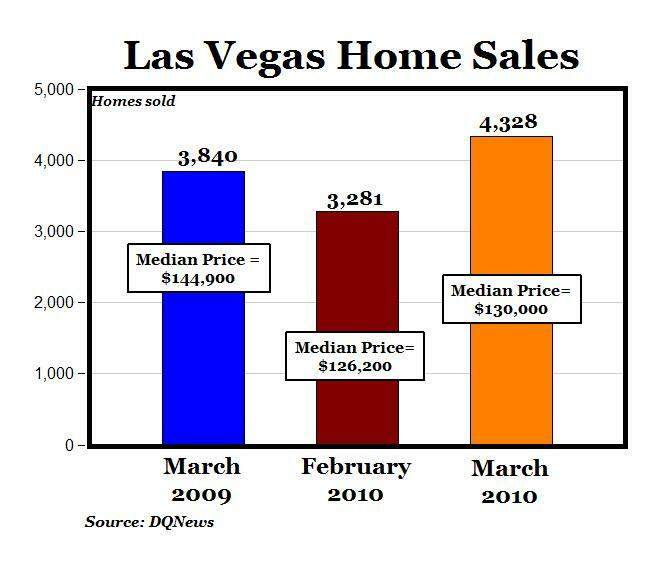 The median price paid for all new and resale houses and condos sold in the Las Vegas metro area in March was $130,000, up 3.0 percent from $126,197 in February but down 10.3 percent from $144,900 a year earlier (see chart above). The year-over-year decline was the smallest since October 2007, when the median dropped 9.2 percent from a year earlier, to $279,790. 6. For the first quarter of this year (January through March), foreclosures totaled 5,611, down 26.4 percent from the prior quarter and down 36.3 percent from a year ago. 1. 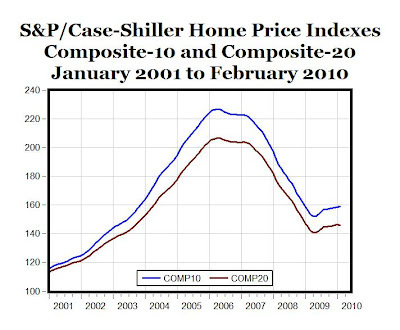 The 10-City Composite Home Price Index (seasonally adjusted) has increased nine consecutive months for the first time since the spring of 2006, almost four years ago, and it reached its highest level since December 2008, 14 months ago (see top chart above). 2. Based on the percentage increase from the same month in the previous year, the annual rates of returns for both home price indexes improved in February, marking the 13th consecutive monthly improvement for the seasonally adjusted Composite-10 Index and the 11th monthly improvement for the Composite-20 Index. For the first time since December 2006, the annual rates of returns are positive for the seasonally-adjusted indexes: 1.48% for the Composite-10 Index compared to last February and 0.70% for the Composite-20. For the unadjusted home price indexes, the annual returns are 1.4% and 0.60%. 3. The city with the biggest annual decline in the Case-Shiller index was Las Vegas, with a -14.6% decrease from last February, but it was the smallest year-over-year decline since November 2007. Open Yale Courses provides free and open access to a selection of introductory courses taught by distinguished teachers and scholars at Yale University. The aim of the project is to expand access to educational materials for all who wish to learn. Here's an example of a class: Financial Markets with Professor Robert Shiller. Test your News IQ at Pew Research with 12 questions on current events. I featured a previous edition of the quiz back in February - a few questions are the same. 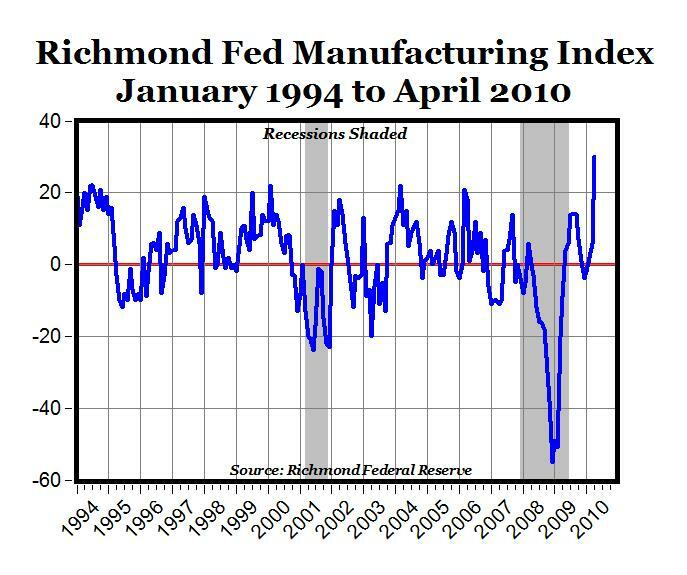 "Manufacturing activity in the central Atlantic region expanded for the third straight month, according to the Richmond Fed's latest survey. All broad indicators — shipments, new orders and employment — landed in positive territory, with manufacturers noting their first increase in worker numbers since October 2009. Other indicators were also positive. Backlogs increased for the first time since August 2009 and capacity utilization hit an all-time high reading since the inception of the measure. Vendor lead-time grew at a considerably quicker rate — the highest reading since August 2004, indicating slower delivery times, and inventories increased at a somewhat quicker pace. In April the seasonally adjusted composite index of manufacturing activity — our broadest measure of manufacturing — jumped 24 points to 30 from March's reading of 6 (see chart above). Among the index's components, shipments moved up 25 points to 30, new orders leaped 31 points to finish at 41, and the jobs index advanced 13 points to end at 13. 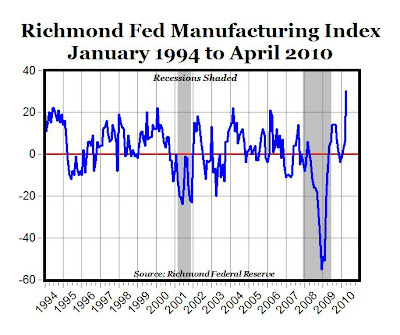 MP: The Richmond Fed Manufacturing index reading of 30 in April was the highest-ever index level in the history of the series back to 1994. 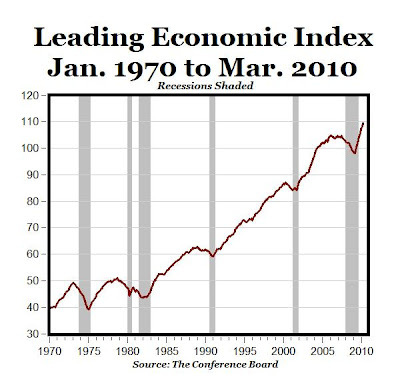 The 85-point increase from -55 in December of 2008 to 30 in April 2010 is probably one of the strongest signs to date of a V-shaped economic recovery. The docks are humming again at this sprawling Pacific port, with clouds of golden dust billowing off the piles of grain spilling into the bellies of giant tankers. “Things are looking up,” said Dan Broadie, a longshoreman. No longer killing time at the union hall while waiting for work, instead he is guiding a mechanized spout pouring 44,000 tons of wheat into the Arion SB, bound for the Philippines. At malls from New Jersey to California, shoppers are snapping up electronics and furniture, as fears of joblessness yield to exuberance over rising stock prices. Tractor trailers and railroad cars haul swelling quantities of goods through transportation corridors, generating paychecks for truckers and repair crews. Global trade holds promise. 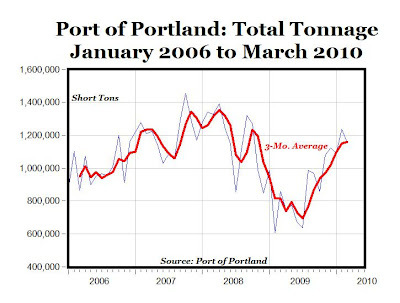 At the Port of Portland — a major shipping point for commodities harvested as far east as the Great Plains — the tonnage of goods swelled by 42 percent during the first three months of the year compared with a year earlier (see chart above, data here). Minerals like soda ash — an important industrial ingredient to make glass and detergent — increased by 93 percent. Activity here and at ports along the Pacific coast is generating business through related industries. Rail freight traffic was up nearly 8 percent in March from a year earlier, according to the Association of American Railroads. That has bolstered revenue for Greenbrier, a Portland-based maker of rail cars that was hard hit during the recession. 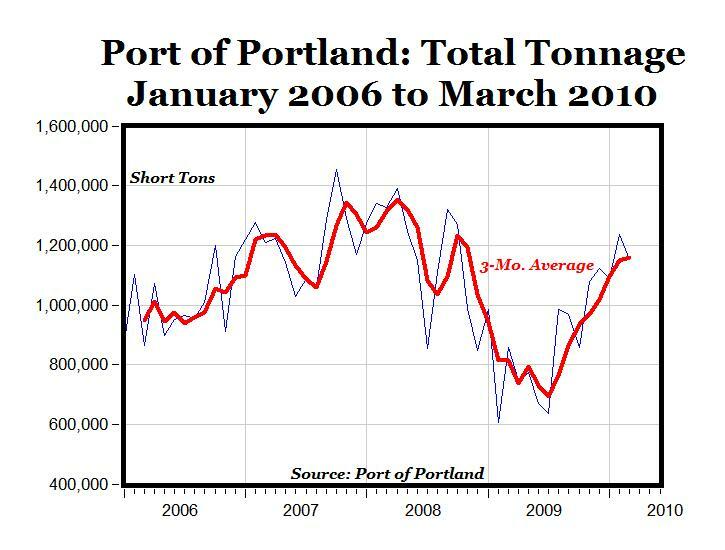 MP: Other highlights from the Port of Portland from its March cargo statistics include: a) a 29.9% increase in grain tonnage for the first quarter this year compared to last year, and the first time since early 2008 of three consecutive months of tonnage above 400,000 short tons; b) a 93.2% increase in bulk mineral shipments for the first three months of 2010 compared to 2009 and c) a 16-month high for the overall shipment volume (3-month moving average basis), the highest level since November 2008. “The National Association for Business Economics' April 2010 Industry Survey confirms that the U.S. recovery from the Great Recession continues, with business conditions improving,” said William Strauss, Federal Reserve Bank of Chicago. From Margaret Thatcher's last House of Commons Speech on November 22, 1990, where she addresses income inequality and a single currency. For the first time in two years, many job seekers may have reason to feel hopeful. Employers are beginning to hire again — or at least think about it. The shift is most apparent in job postings, which have begun to surge. 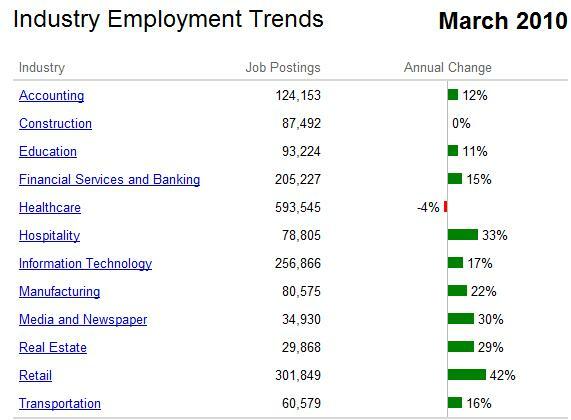 Indeed.com, which collects job listings from thousands of sources, reported a 19 percent increase in postings in March, versus the same month last year. The number of postings rose in 10 of 12 industry categories. 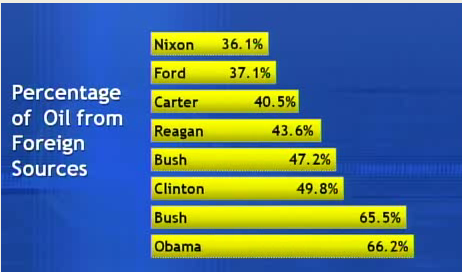 (The only category that declined was health care, one of the few bright spots during the recession.) The industries that showed the biggest uptick in March openings were retail, up 42 percent; hospitality, 33 percent; and media and newspapers, 30 percent. The current outlook is a contrast to the deep gloom of 2008 and 2009. Companies’ profit reports, recent retail sales, manufacturing and other data are generally improving. At some point, businesses will have more work than workers, and will need to hire. "The 1950s was the era of the 90 percent top marginal tax rate, and by the end of that decade live gate receipts for top championship fights were supplemented by the proceeds from closed circuit telecasts to movie theaters. A second fight in one tax year would yield very little additional income, hardly worth the risk of losing the title. And so, the three fights between Floyd Patterson and Ingemar Johansson stretched over three years (1959-1961); the two between Patterson and Sonny Liston over two years (1962-1963), as was also true for the two bouts between Liston and Cassius Clay (Muhammad Ali) (1964-1965). Then, the Tax Reform Act of 1964 cut the top marginal tax rate to 70 percent effective in 1965. The result: two heavyweight title fights in 1965, and five in 1966." MP: A few lessons: 1) If you tax something, you get less of it, and 2) if you cut tax rates, you might get more tax revenues. 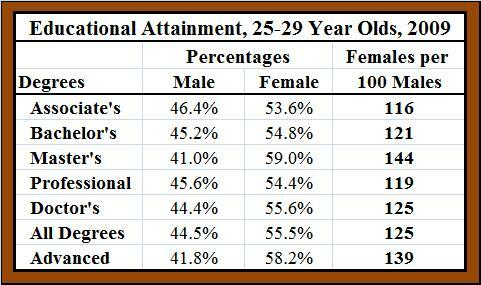 "It's a sad statistical reality: Half of us are below average." To be more precise, it should be "half of us are below the median." Thanks to Steve in his comment for providing information about Fisman's background. 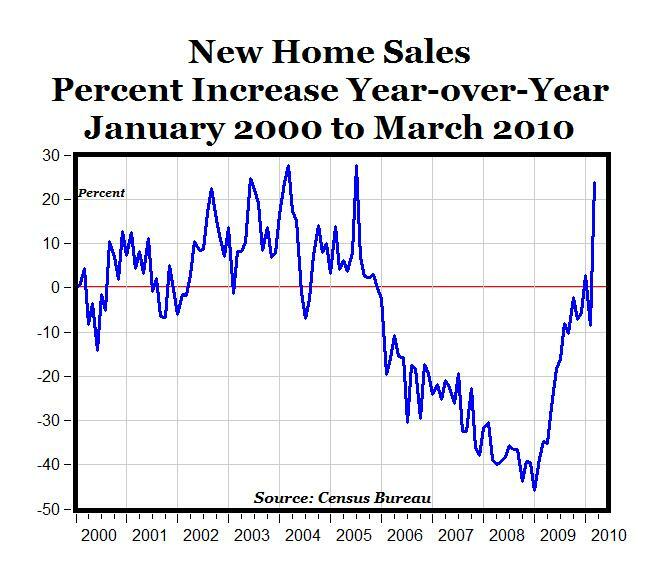 "Great Housing Market Bust is Over"
New home sales increased in March by 23.8% compared to the same month last year, the largest annual increase in new home sales since the month of July 2005, according to data released yesterday by the Census Bureau (see chart above). 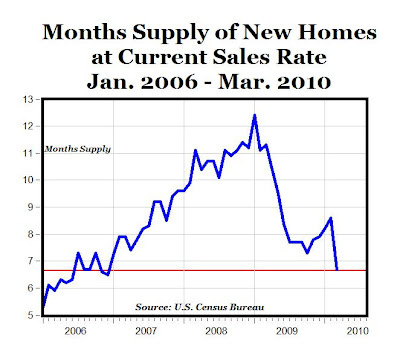 As a result of the increased sales activity for new homes at the same time that the supply is at a 39-year low, the inventory measure "months supply of new homes at the current sales rate" fell to the lowest level since December 2006, signalling that the balance between supply and demand of new homes is back to a more normal, pre-crisis level (see graph below). 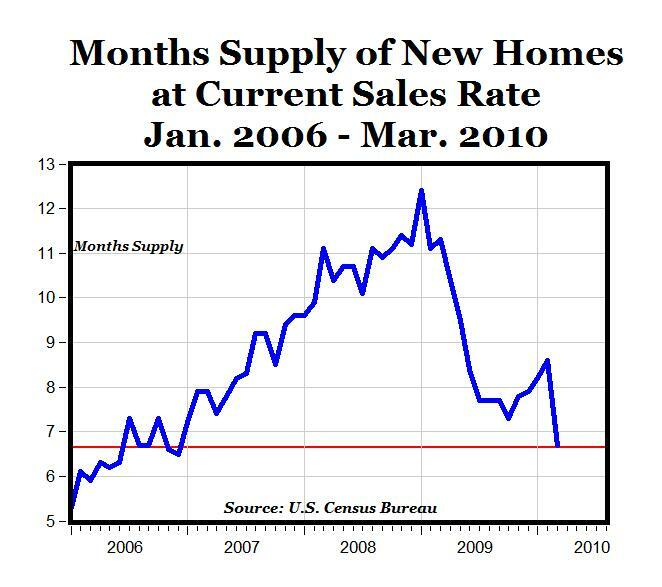 MP: Friday's new data on new home sales through March point to a housing market that is past the bottom and in a new period of recovery. 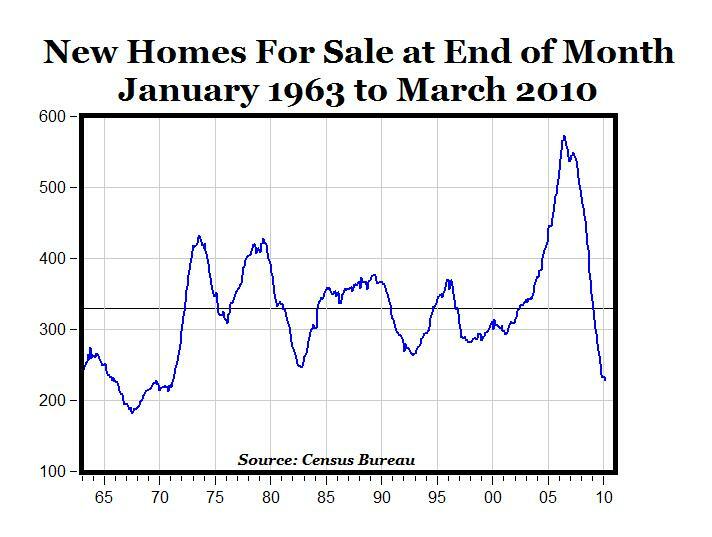 See Scott Grannis' recent post on existing home sales, where Scott concludes that "The resulting picture becomes quite clear: the great housing market bust is over, and a new growth cycle is underway." SACRAMENTO BEE -- First, people decided they didn't want to drive to the movie theater. These days they aren't too keen on driving to the video store, either. In a sign of the times, Netflix saw its stock price top $100 a share Thursday after posting blowout earnings – the same week that another Blockbuster outlet closed, this one on 29th and K streets in Sacramento. Blockbuster and Hollywood Video are closing local outlets as nationally, both companies feel the heat from game changers like Netflix and Redbox, which rents movies for $1 a night out of vending machines in supermarkets. Brick and mortar video stores are under pressure from the online world, just like record stores and booksellers before them. We want to rent DVDs quickly by mail or pick them up at the supermarket. And that's if we bother handling a physical disc at all. Increasingly, we just stream movies on laptops and smart phones or download them right to our PlayStations or Xboxes, so we can watch them on our flat-panel TVs. "The model has changed," said Maithu Bai, owner of Awesome Video, an independent video rental store on Freeport Boulevard. "It's not just here; it's across the nation. In these times, people want something new." MP: The chart above shows that since last September, Netflix stock has more than doubled while Blockbuster's stock has declined by more than 50%. • There is a holy day—Earth Day. • There are food taboos. Instead of eating fish on Friday, or avoiding pork, Greens now eat organic foods and many are moving towards eating only locally grown foods. • There is no prayer, but there are self-sacrificing rituals that are not particularly useful, such as recycling. Recycling paper to save trees, for example, makes no sense since the effect will be to reduce the number of trees planted in the long run. • Belief systems are embraced with no logical basis. For example, environmentalists almost universally believe in the dangers of global warming but also reject the best solution to the problem, which is nuclear power. These two beliefs co-exist based on faith, not reason. • There are no temples, but there are sacred structures. As I walk around the Emory campus, I am continually confronted with recycling bins, and instead of one trash can I am faced with several for different sorts of trash. Universities are centers of the environmental religion, and such structures are increasingly common. While people have worshipped many things, we may be the first to build shrines to garbage. • Environmentalism is a proselytizing religion. Skeptics are not merely people unconvinced by the evidence: They are treated as evil sinners. I probably would not write this article if I did not have tenure." Update: Thanks to Barry Rithhokz for pointing out that there was a one-time accounting change that led to the jump. 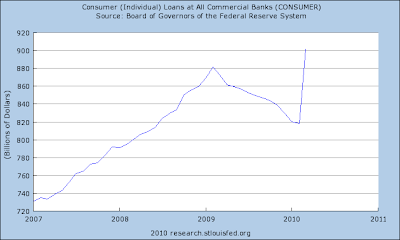 Consumer lending jumped by more than $83 billion in March to $901.6 billion, the highest level in history, according to data recently released by the Federal Reserve (see chart above). 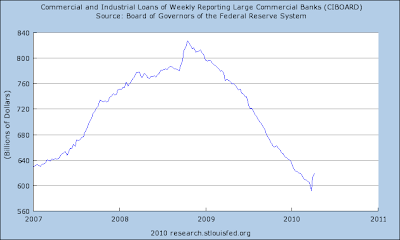 Business lending increased the last week of March and the first week of April, the first two back-to-back weekly increases since December 2008, see chart below (data here). Brian Wesbury and Scott Grannis remain concerned about inflation, citing the recent Producer Price report from the BLS. 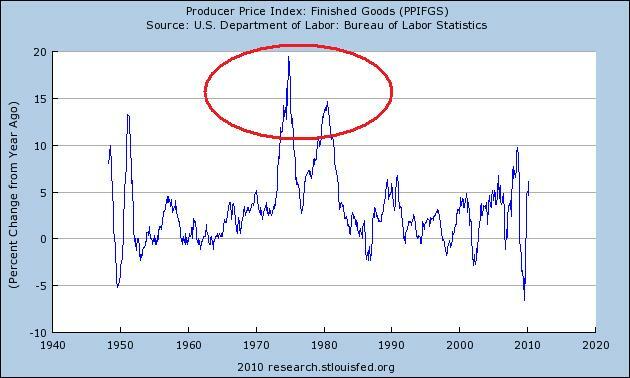 I remain an inflation skeptic based on the two charts above, which show that the 10-15% producer price inflation in the 1970s (bottom chart) was accompanied by much, much higher money growth (top chart). The core ingredient of inflation (producer or consumer) is money growth, and there just doesn't seem to be enough M2 money growth to generate 1970s-era inflation. Steven Hayward: One thing that should be clear from the experience of the last 40 years is that the most significant environmental problems are in the developing world, and that economic growth is the key—not the enemy—of environmental improvement. For example, not a single American or European city ranks among the World Bank’s top 50 most polluted cities in the world. Kenneth Green: If you care about the environment, you should observe this special day with a joyful spree of consumption, especially buying goods from people in poor countries. By engaging in trade with other countries, we help them grow wealthier, helping them to afford environmental protection, while we help ourselves by gaining access to goods and services that it might be impossible, or ruinously expensive, for us to manufacture ourselves. The sooner people grow wealthy, the sooner the environment will benefit. Now, get shopping! Arnold Kling: At MIT and other bastions of mainstream economics, most economists are to the left of center but to the right of the academic community as a whole. These economists are known for saying, in effect, "Markets fail. Use government." Masonomics (George Mason economists) says, "Markets fail. Use markets." Jonah Goldberg: Washington's solution to Wall Street's problems is to get Washington deeply, deeply involved in Wall Street. So involved that the savvier capitalists will recognize -- once again -- that the safest bets are not to be found in the vicissitudes of a fickle marketplace, but in gaming the system run from Washington. 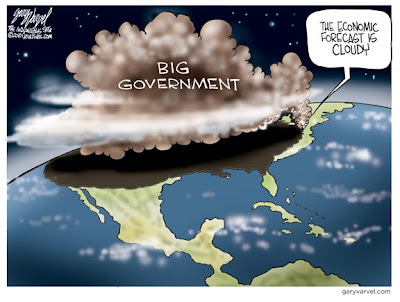 The "reform" coming down the pike will put bureaucrats in charge of investors. We are fond of saying that the answer to free-speech problems is more free speech. But we seem incapable of grasping that sometimes -- and only sometimes -- the solution to capitalism's problems is more capitalism. 1. Highest Fatality Rate (Deaths per 100,000 workers): "Farming, forestry and fishing" is #1 with 29.4 deaths per 100,000 workers in 2008, occupation is 79.5% male; followed by mining at #2, with 18 deaths per 100,000 workers, occupation is 98% male. 2. Highest Number of Fatalities: Construction, 969 deaths in 2008, occupation is 97.4% male; followed by transportation with 762 deaths in 2008, occupation is 84.7% male. Update: 92.74% of all work-related deaths in 2008 were men (4,703 male deaths vs. 368 for women), which is ratio of almost 13 male occupational deaths for every one female death. "The Association of American Railroads said today that signs of recovery in U.S. freight rail traffic continue to gain momentum, with carload volume last week reaching its highest level since the week ended December 6, 2008. U.S. railroads originated 296,599 carloads during the week ended April 17, 2010, up 16.1 percent from the comparable week in 2009. 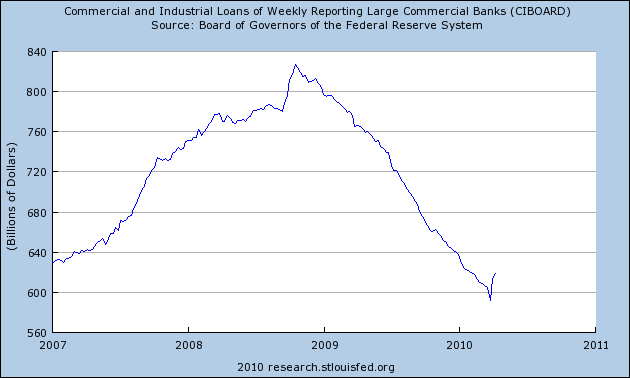 However, volume was still down 11.6 percent from the same week in 2008. In order to offer a complete picture of the progress in rail traffic, AAR now reports 2010 weekly rail traffic with comparison weeks in both 2009 and 2008. Intermodal traffic totaled 209,903 trailers and containers, up 14.6 percent from last year but down 6.3 percent compared with 2008. Compared with the same week in 2009, container volume increased 16.7 percent while trailer volume gained 4 percent. Compared with the same week in 2008, container volume was up 1.6 percent while trailer volume fell 35.3 percent. Eighteen of 19 carload commodity groups were up from last year, led by a 177.5 percent jump in loadings of metallic ores. Other notable increases included 68.8 percent for metals, 49 percent for motor vehicles and equipment, 46.4 percent for nonmetallic minerals and 34.5 percent for primary forest products. Grain was up 12.2 percent, and coal gained 9.6 percent. 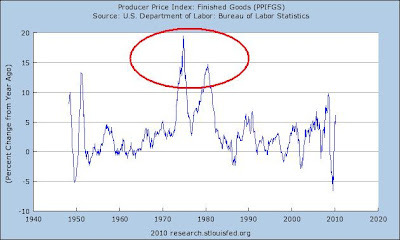 The only commodity registering a decline was pulp, paper and allied products, off 6.7 percent." TOKYO — "Japan's exports rose for a fourth straight month in March as a recovering global economy drove demand for the nation's cars and gadgets. Exports jumped 43.5 percent from a year earlier the government said Thursday. The figures offer more evidence that robust growth, particularly in Asia, is feeding a turnaround in the world's second-biggest economy, offsetting weak demand and falling prices at home. Shipments rose worldwide, with those to Asia up almost 53 percent. Exports to the U.S. grew 30 percent, and those to the European Union rose 27 percent, the finance ministry said. Overseas shipments of vehicles more than doubled, while electrical machinery exports were up 43 percent. Global demand fueled Japan's economy to expand at an annualized pace of 3.8 percent in the October-December period and likely led to another strong showing in the first quarter. "The possibility that the economy will experience a double-dip recession in 2010 now appears extremely unlikely. Instead, the focus has shifted to how broadly the recovery will expand," said Kyohei Morita, chief Japan economist at Barclays Capital." Intrade odds for the Republicans to control the House of Representatives after 2010 Congressional Elections: 50.3%. MARKETWATCH -- "John Paulson, the hedge fund manager famous for betting against mortgage securities, is now bullish on the U.S. housing market and the economy. During a conference call with investors Wednesday, Paulson said he was concerned earlier this year about a potential double-dip recession. "I'm not concerned about that at all today," he said. It's more likely there could be a V-shaped recovery, Paulson continued. 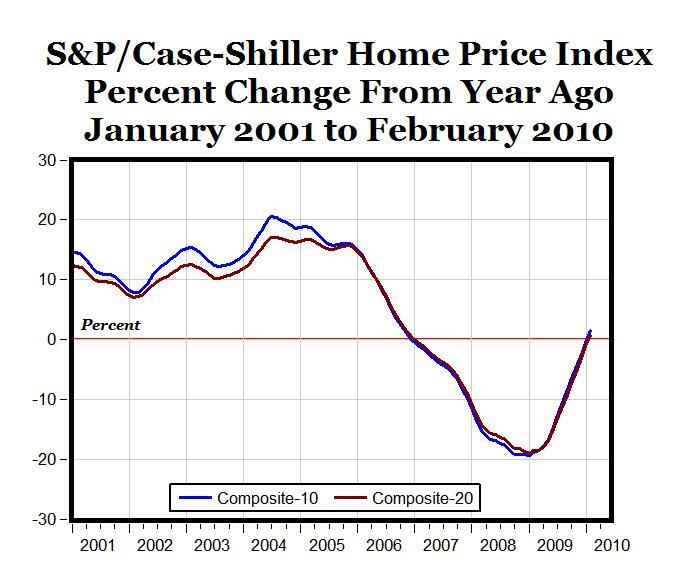 House prices have stabilized and could climb 8% to 10% nationwide in 2011, Paulson said. Corporate earnings are coming in ahead of expectations, the stock market is stronger and there's a "vibrant" credit market. 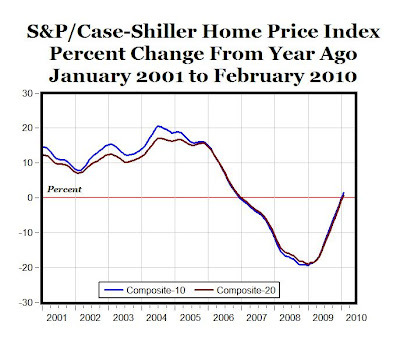 With the "final leg" of a rising housing market, "the outlook for 2011 could be very strong," Paulson said." 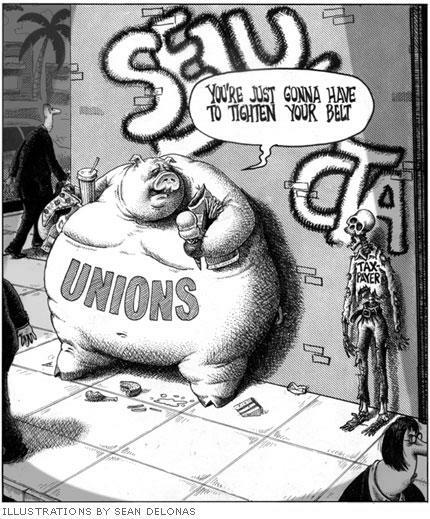 "The public sector unions’ political triumphs have molded a California in which government workers thrive at the expense of a struggling private sector. The state’s public school teachers are the highest-paid in the nation. Its prison guards can easily earn six-figure salaries. State workers routinely retire at 55 with pensions higher than their base pay for most of their working life. 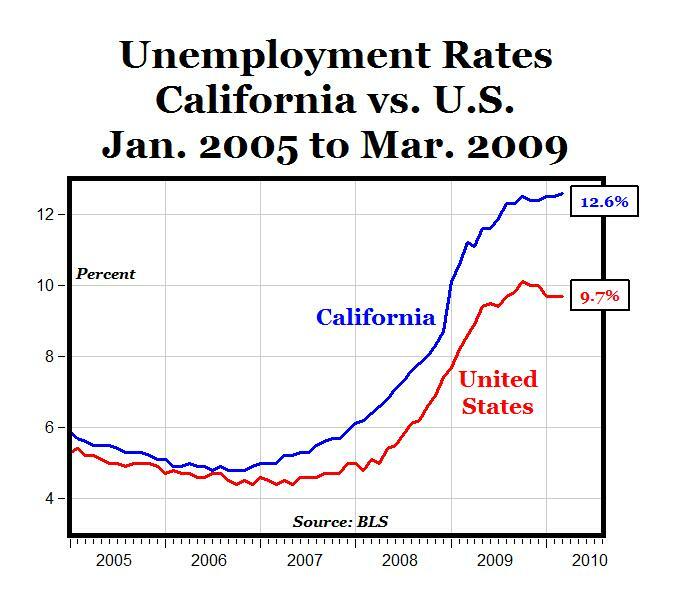 Meanwhile, what was once the most prosperous state now suffers from an unemployment rate far steeper than the nation’s and a flood of firms and jobs escaping high taxes and stifling regulations (see nearby chart). This toxic combination—high public-sector employee costs and sagging economic fortunes—has produced recurring budget crises in Sacramento and in virtually every municipality in the state." "How public employees became members of the elite class in a declining California offers a cautionary tale to the rest of the country, where the same process is happening in slower motion. The story starts half a century ago, when California public workers won bargaining rights and quickly learned how to elect their own bosses—that is, sympathetic politicians who would grant them outsize pay and benefits in exchange for their support. Over time, the unions have turned the state’s politics completely in their favor. 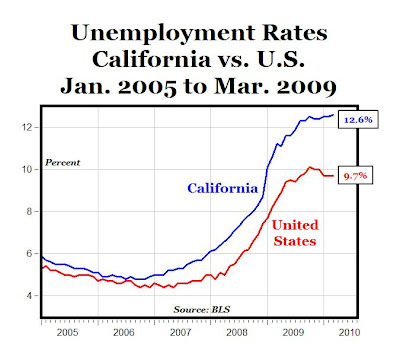 The result: unaffordable benefits for civil servants; fiscal chaos in Sacramento and in cities and towns across the state; and angry taxpayers finally confronting the unionized masters of California’s unsustainable government." "Lending institutions started formal foreclosure proceedings on fewer California homes last quarter. It is unclear how much of the drop can be attributed to shifts in market conditions, and how much is because of changing policies, a real estate information service reported. A total of 81,054 Notices of Default were recorded at county recorder offices during the January-to-March period. That was down 4.2% from 84,568 for the prior quarter, and down 40.2% from 135,431 in first-quarter 2009, according to San Diego-based MDA DataQuick." 1. Average hourly wages are $18.90, up from $18.52 a year ago. (Before employers hire full-time, they get their workers to work overtime, resulting in higher pay). 2. 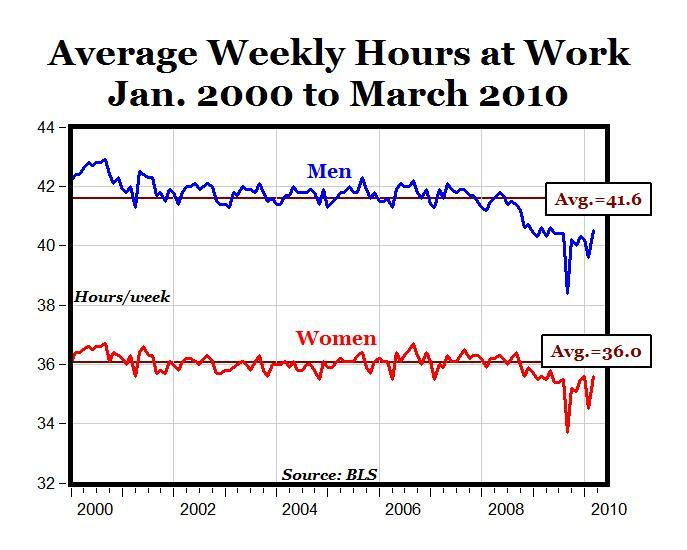 Aggregate weekly hours worked is the highest it's been since June 2009 -- again, suggesting overtime. Only so much overtime can be worked before hiring begins. 3. Industrial production index up 9 months in a row after plummeting 13 percent from December 2007 to June 2009. 4. Retail sales up 10 percent year over year. 5. GDP last quarter showed 5.9 percent annual growth. 6. Initial unemployment claims have gone from a peak of 643,000 in April 2009 to 480,000 now. 7. The Greek debt crisis seems to be ending without major fallout in the form of other nations defaulting. 8. Home-improvement-related retail sales were up 3.1 percent, suggesting consumers are putting money back into their homes again. 9. Railroad traffic, a sign of interest in commodities, is up 16 percent, the highest since the recession began. 10. Rail shipments of metals were strongest as manufacturers are rebuilding inventories. 11. JPMorgan Chase and Bank of America both announced loan delinquencies were decreasing. JPMorgan also announced plans to hire 9000, their biggest hiring spree since the recession began. 12. UPS profits were 20 percent higher than expected as US shipments saw their first year-over-year increase since 2007. 13. 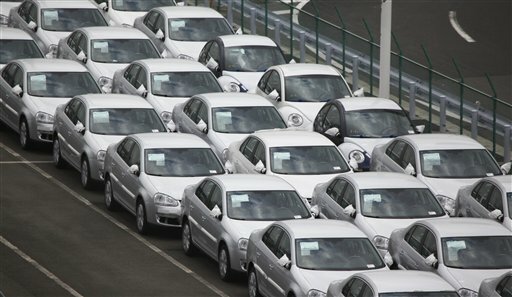 Economists estimate that China's GDP grew by 11 percent last quarter, the most in 3 years. 14. Singapore posted GDP growth of 9 percent last quarter and South Korea had the largest unemployment rate drop in over a decade. 15. A sharp increase in M&A activity where the acquirers are using cash rather than stock to buy companies (showing confidence in their businesses). 16. Target, Kohls, TJX and Aeropostale all increased earnings guidance for the next quarter, showing retail strength across the board. 17. 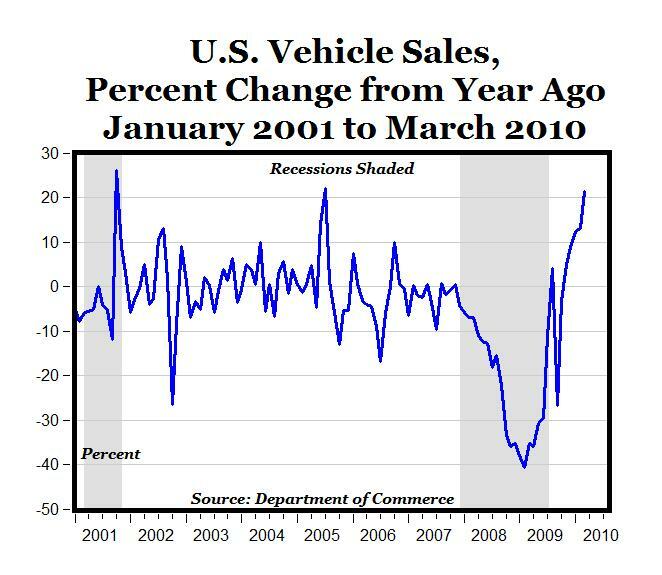 Auto sales are spiking. March annualized auto sales showed a 15 percent gain over February. 18. ISM non-manufacturing index (showing the strength of non-manufacturing indexes) had the highest percent increase in five years. 19. The National Association of Realtors said that pending sales of existing homes jumped 8.2 percent over last month. 20. 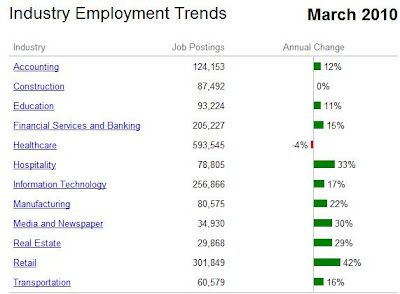 Employers added 162,000 jobs in March, the biggest gain in four years. 21. Ford reported the best monthly sales in 25 years. 22. 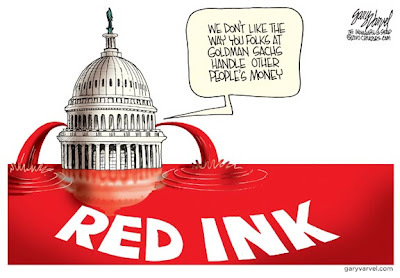 The government has made money on its Troubled Asset Relief Program bailouts of Citigroup, Goldman Sachs, American Express, JPMorgan, Morgan Stanley, and almost every other bank they lent to. 23. Consumer spending had its fastest increase in three years last month. 24. Intel, a barometer of the entire tech sector, saw its earnings quadruple from a year ago and said its earnings were the best ever for that period. They also reported record results for the chips used in mobile devices and said corporate tech spending was growing across the US. 25. Despite growth and low interest rates, inflation is almost non-existent with the CPI coming in at 0.1 percent last month." "The U.S. Census Bureau reported today more women than men are expected to occupy professions such as doctors, lawyers and college professors as they represent approximately 58 percent of young adults, age 25 to 29, who hold an advanced degree." In other words, 139 women in the 25-29 year old group hold an advanced degree for every 100 men in that age group, and women dominate men for all advanced degrees: Master's, Professional (MD, DDS and JD), and Doctor's (Ph.D.). Note: These are actual numbers based on actual data and empirical evidence about gender differences, in contrast to Equal Pay Day. Today is Equal Pay Day, the date that is supposed to symbolize how far into 2010 the average woman would have to work to earn the same income that the average man earned in 2009—see Christina Sommers’s excellent article in The American, “The Equal Pay Day Reality Check.” Here's the Presidential Proclamation, and here's the statement from Secretary of Labor Hilda Solis, and here's an editorial from Diana Furchgott-Roth. According to the Bureau of Labor Statistics’s (BLS) most recent annual report, “Highlights of Women’s Earnings in 2008,” women who worked full-time in 2008 had median earnings of $638 per week, or about 80 percent of the $798 median weekly earnings for men working full-time. But for single workers who have never been married, the BLS reports that women made 94.2 percent as much money as their male counterparts in 2008. Equal Pay Day would fall on January 22 for these single females, almost three months earlier than the official, unadjusted Equal Pay Day of April 20 for all women. For a separate BLS category of single workers, those with “no children under 18 years old and whose marital status includes never married, divorced, separated and widowed,” women earned 95.6 percent as much as their male counterparts in 2008. Equal Pay Day for that group of single female workers would fall even earlier, on January 19, only a few weeks into the year. While the Equal Pay Day advocates emphasize gender discrimination as the most important source of wage differentials, the reality is that most of the wage gap can be explained by life choices that involve family considerations, work hours, and career choices. The BLS data highlighted above show that simply controlling for marriage and children explains more than 70 percent of the unadjusted wage gap. Other factors could easily account for the rest. 1. 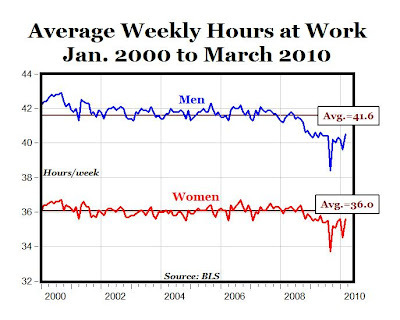 On average, men work 5.6 more hours per week than women—the equivalent of seven additional weeks of full-time work per year (see chart above). That would put “Equal Work Day” at the end of February, symbolizing how far the average women would have to work into 2010 to equal the same number of hours that the average man worked in 2009. 2. The unemployment rate for men has been greater than the jobless rate for women for the last 40 months, and job losses during the depth of the last recession were four times greater for men. 3. There were 1,277 male occupational fatalities in 2008 for every 100 female work-related deaths, a ratio of almost 13:1. An important question then for women on Equal Pay Day: Would perfect labor market equality really be worth it if it meant working 280 more hours per year, having a much greater chance of being unemployed during recessions, and being significantly more exposed to work-related injury and death? Cross-posted today on the Enterprise blog. If America’s economic landscape seems suddenly alien and hostile to many citizens, there is good reason: they have never seen anything like it. Nothing in memory has prepared consumers for such turbulent, epochal change, the sort of upheaval that happens once in 50 years. Even the economists do not have a name for the present condition, though one has described it as "suspended animation" and "never-never land." The outward sign of the change is an economy that stubbornly refuses to recover from the recession. In a normal rebound, Americans would be witnessing a flurry of hiring, new investment and lending, and buoyant growth. But the U.S. economy remains almost comatose a full year and a half after the recession officially ended. Unemployment is still high; real wages are declining. At a TIME economic forum last week, forecasters predicted that U.S. growth would amount to only 1.8% this year and 2.6% for 1993, about half the speed of a normal recovery. The current slump already ranks as the longest period of sustained weakness since the Great Depression. That was the last time the economy staggered under as many "structural" burdens, as opposed to the familiar "cyclical" problems that create temporary recessions once or twice a decade. The structural faults, many of them legacies of the 1980s, represent once-in-a-lifetime dislocations that will take years to work out. Among them: the job drought, the debt hangover, the defense-industry contraction, the savings and loan collapse, the real estate depression, the health-care cost explosion and the runaway federal deficit. "This is a sick economy that won't respond to traditional remedies," said Norman Robertson, chief economist at Pittsburgh's Mellon Bank. "There's going to be a lot of trauma before it's over." MP: Sound familiar? It could easily have been written to describe the current situation, but it was actually written at the end of September 1992, a full 18 months after the 1990-1991 recession had ended in March 1991. More importantly, it was written in the early stages of the longest (120 month) and strongest economic expansion in the history of the U.S. economy that lasted until March 2001. Maybe media "gloom and doom" is a good leading indicator of future economic expansion. Hopefully it's "déjà vu" all over again. LA Times -- The index of U.S. leading indicators rose in March by the most in 10 months, a sign the economy will keep growing into the second half of the year. The 1.4 percent increase in the New York-based Conference Board's measure of the outlook for three to six months was more than anticipated and followed a revised 0.4 percent gain in February. Manufacturers are ratcheting up production and factory workers are putting in longer hours as companies rebuild inventories and ship more goods overseas. Further improvement in the job market will help sustain the economy's recovery from the worst recession since the 1930s. "The economy really seems to be gaining momentum, with better-than-expected data coming from a wider variety of sources," said Russell Price, a senior economist at Ameriprise Financial Inc. in Detroit. "The sectors that were doing well appear to be doing even better and those that were struggling appear to be seeing signs of renewed activity." MP: The Leading Economic Index has now increased in each month since last April, which is the first 12-consecutive month increase since mid-2004, almost six years ago. 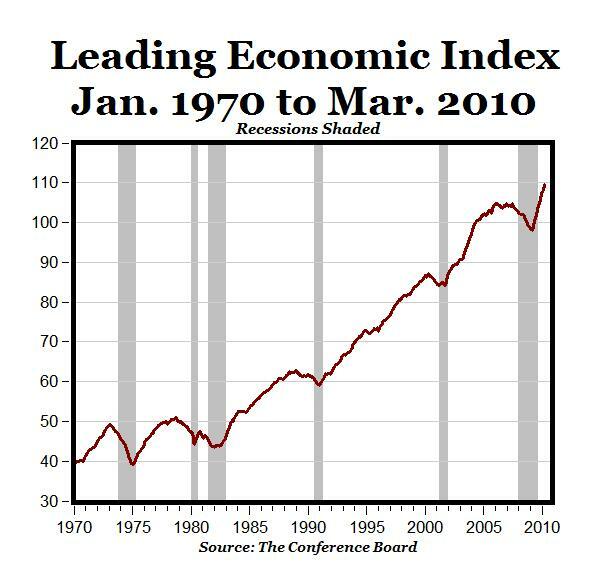 The unadjusted 1.5 point increase in the index from 108.1 in February to 109.6 in March was the largest monthly increase in the history of the index back to 1970, and on a percentage basis, the 1.4% increase was the highest in six years, since March of 2004. "The long-term decline of the U.S. economy has been greatly exaggerated. America is coming back stronger, better, and faster than nearly anyone expected—and faster than most of its international rivals. The Dow Jones industrial average, hovering near 11,000, is up 70 percent in the past 13 months, and auto sales in the first quarter were up 16 percent from 2009. The economy added 162,000 jobs in March, including 17,000 in manufacturing. The dollar has gained strength, and the U.S. is back to its familiar position of lapping Europe and Japan in growth. Among large economies, only China, India, and Brazil are growing more rapidly than the U.S.—and they're doing so off a much smaller base. If the U.S. economy grows at a 3.6 percent rate this year, as Macroeconomic Advisers projects, it'll create $513 billion in new economic activity—equal to the GDP of Indonesia. The last two expansions have been 120 months and 92 months, respectively. If the U.S. continues to adapt as it has, and if it produces a few more game changers like Google and Apple, there's no reason that the expansion that started in July 2009, against all the odds and predictions, can't last just as long." 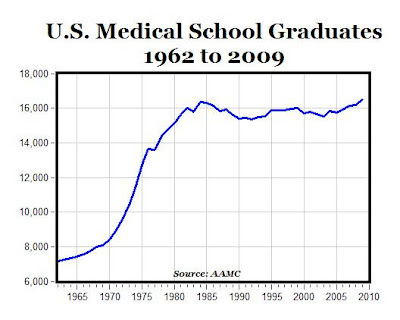 The supply of medical school graduates has remained basically flat for the last 30 years (data here). At the same time, the demand for physicians' services has increased over time because of a population that is both increasing and aging. 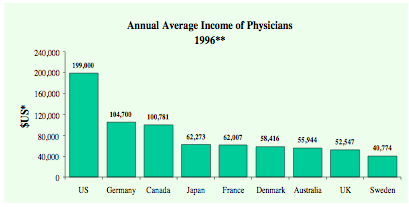 So we've now got more people with more serious end-of-life medical problems demanding more medical care from a limited supply of physicians - and that's a sure prescription for rising MD salaries. "The marketplace doesn't determine how many doctors the nation has, as it does for engineers, pilots and other professions. The number of doctors is a political decision, heavily influenced by doctors themselves. Congress controls the supply of physicians by how much federal funding it provides for medical residencies — the graduate training required of all doctors." 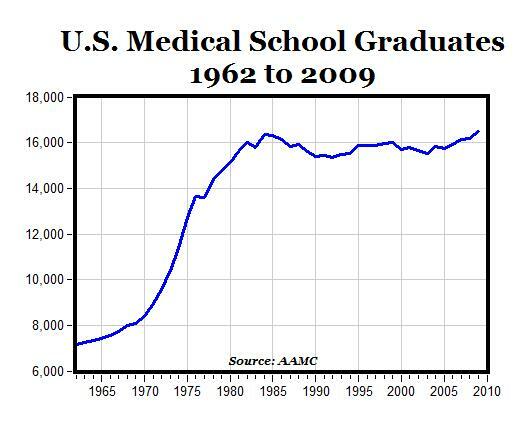 And we're now going to provide health care to an additional 20-30 million Americans under health care reform when the number of new physicians this year is about the same as the graduating class of 1980? Just wondering, did Congress ever consider the reality reflected in the graph above that there has been no increase in the supply of physicians for the last 30 years when they passed health care reform to extend coverage to millions of uninsured? "Thanks to health care reform, millions of previously uninsured Americans will have policies enabling them to go to the doctor when necessary without financial fear. But it's a bit like giving everyone a plane ticket to fly tomorrow. If the planes are all full, you won't be going anywhere. There are not a lot of doctors sitting in their offices like the Maytag repairman, playing solitaire and wishing a patient would drop by. Most of them manage to stay plenty busy. Nor is there a tidal wave of young physicians about to roll in to quench this new thirst for medical care. Regardless, there seems to be no doubt that it will get harder to find someone to treat you, it may cost more and you'll spend two hours in the waiting room instead of one. Or maybe not. What people with medical problems need is medical care, but you don't always need a physician to get treatment. You might also see a different sort of trained professional — say, a nurse practitioner, physician's assistant, nurse or physical therapist." "The medical establishment is fighting to protect turf. The American Medical Association, which supported the national health care overhaul, says a doctor shortage is no reason to put nurses in charge and endanger patients." Who's Linking to Carpe Diem? The Year of the "Plow Horse Housing Recovery"